If you want that player style that looks like you belong driving a Porsche, you need to get with stylish designer jackets by Manzini. Manzini makes those designer blazers that are seen on Celebrities whenever they are not on film or on the Court. 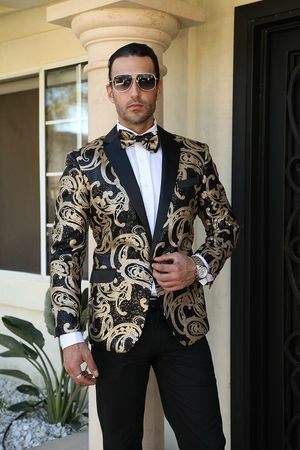 This fancy designer jacket has sequins on it in a head turning pattern with that Modern fit that just looks good on you.